The 40th Antarctic Treaty Consultative Meeting (ATCM) and the 20th Meeting of the Committee for the Environmental Protection (CEP) will be held in Beijing from May 22 to June 1. Vice Premier Zhang Gaoli of the State Council will attend and address the opening ceremony on May 23. Q: Special Envoy Lee Hae-chan of the ROK President who arrived in Beijing today said he will work for a meeting between the Chinese and the ROK leaders during the G20 summit in July, and an official leaders' meeting when China and the ROK celebrate the 25th anniversary of the establishment of their diplomatic ties. What is your comment? A: The fact that President Moon Jae-in tasked his Special Envoy Lee Hae-chan to visit China for talks soon after he took office shows the important the new ROK government attaches to its relationship with China. China also values its relationship with the ROK. We would like to work with the ROK to improve and develop bilateral ties at a new starting point. We hope that the Special Envoy's visit would play a positive role in enhancing political mutual trust, properly dealing with disputes, and driving the improvement and development of the China-ROK relationship. Foreign Minister Wang Yi will meet with his delegation. The two sides will exchange views on bilateral relations and issues of mutual interest. Q: Could you give us more details regarding the upcoming 40th ATCM? What has been planned for this meeting by China as the host? What does China expect to achieve? A: The ATCM is an annual decision-making mechanism established under the Antarctic Treaty. It is an important intergovernmental multilateral conference on Antarctic international governance. China acceded to the Antarctic Treaty in 1983 and became a Consultative Party in 1985. This will be the first time for an ATCM to be held in China. So far, nearly 400 representatives from 42 countries and 10 international organization have registered for participation. Major topics will include the operation of the Antarctic Treaty System, Antarctic expeditions, Antarctic tourism, climate change implications, and Antarctic special protection and management areas. Vice Premier Zhang Gaoli will attend and address the opening ceremony. State Councilor Yang Jiechi will hold a welcome banquet for all the attendees and give a speech. As the host, China will do its best to ensure that this meeting will be a high-level one following international and professional standards while presenting Chinese characteristics. We would engage all parties in active discussions for positive progress in the Antarctic scientific research, regional management and protection, and tourism. As usual, China will issue a Host Country Communique to sum up the whole meeting and major achievements. On the sidelines, China will host a special session "Our Antarctic: Protection and Utilization", issue the Report on China's Antarctic Cause, and sign polar cooperation memorandums with the US, Russia and Germany. China will encourage extensive discussions on the Green Expedition Initiative initiated by China and jointly submitted with the US and Australia. Q: The US Department of Treasury announces sanctions against a Chinese citizen and three Chinese companies that allegedly support and provide equipment to Iran's ballistic missile programs. What is your comment? A: China's position on the issue of non-proliferation is clear. 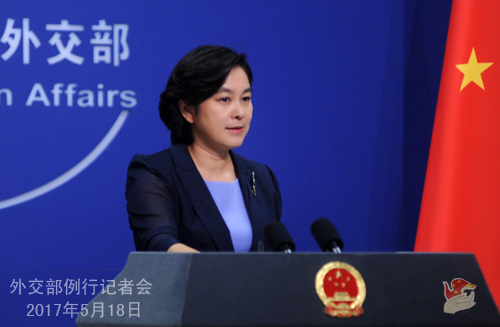 China opposes all forms of proliferation activities and organizes its non-proliferation work in accordance with domestic policies, laws and regulations while strictly fulfilling its relevant international obligations and promises. China always opposes unilateral sanctions. Using unilateral sanctions at every possible turn will not help build mutual trust between relevant parties, nor will it help the efforts made by all parties to resolve the relevant international issue through cooperation, especially when such sanctions jeopardize the interests of a third party. China has lodged representations with the US side. We hope that relevant concerns over non-proliferation could be resolved through dialogue and cooperation on the basis of mutual respect, equality and mutual benefit. Q: Is China looking at ways to address India's concerns over the China-Pakistan Economic Corridor (CPEC)? A: You question has been on the mind of many journalists from India as well. And we have also responded to this question many times. The Belt and Road Initiative is an open and cooperative one. It operates under the principle of joint contribution, extensive consultation and shared benefits. All countries along the Belt and Road are welcome to join the initiative to share development opportunities and benefits. As part of the Belt and Road Initiative, the CPEC will help enhance regional connectivity and promote common development and prosperity for regional countries. As for the Kashmir issue our Indian friends are very concerned about, we've said that it is an issue between India and Pakistan, and hopefully will be resolved by the two sides through dialogue and negotiation. The CPEC will not change China's position on the Kashmir issue. Q: An official from the Indian ruling party wrote in an article that the name CPEC is itself objectionable, because it passes through disputed areas that belong not to China, nor Pakistan. Will China consider changing the name of this corridor? A: Here I will not repeat our position on the Kashmir issue because it has been talked about so many times. I just want to add one thing. China pursues friendly and cooperative relations with countries around the world on the basis of the Five Principles of Peaceful Co-existence, promoting regional connectivity being part of that. The CPEC has nothing to do with territorial sovereignty disputes and will not affect China's position on the Kashmir issue. Q: US Ambassador to the UN Nikki Haley said that the international community has a choice to make. It is either the US or the DPRK. And supporting the DPRK would mean standing against all the other members of the international community. What is your comment? A: The Korean Peninsula nuclear issue could be dated back a long way. It is too much complicated to be approached by the simple logic of "either or". 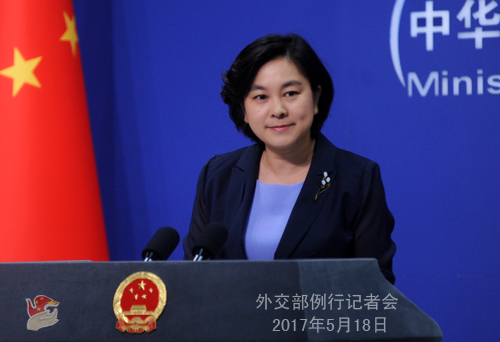 On the Peninsula nuclear issue, China, on one hand, opposes the DPRK's violations of the UN Security Council resolutions in its obstinate pursuit of nuclear and missile development, and on the other, cannot agree with imposing sanctions regardless of the consequences or threatening to ramp up sanctions. China always maintains that dialogue and consultation represents the only viable way to properly resolve the Peninsula nuclear issue. No matter what happens, there are two basic points regarding the Peninsula nuclear issue that must be met. The first is to realize denuclearization of the Peninsula and safeguard international non-proliferation regime. The second is to preserve peace and stability on the Peninsula. It serves the common interest of all relevant parties. At the current stage, it is imperative that all parties shall refrain from further escalating tensions. Q: It is reported that Japanese Prime Minister Abe and visiting Prime Minister English of New Zealand made a joint statement in which they expressed concerns over the tense situation in the South China Sea and the South China Sea arbitration case also came up in the statement. What is your response? A: We have noted the South China Sea-related contents in the Japan-New Zealand Joint Statement, which I find rather inopportune. With the concerted efforts of China and other coastal countries, the situation in the South China Sea is improving towards greater stability. Leaders of ASEAN member states like Indonesia, Laos, the Philippines, Vietnam, Cambodia, Malaysia and Myanmar were here for the BRF. When they met with the Chinese leadership, they all expressed the aspiration to enhance cooperation and jointly preserve regional peace and stability. Today and tomorrow, China and ASEAN member states will hold the 14th Senior Officials' Meeting on the Implementation of the DOC and the 23rd China-ASEAN Senior Officials' Consultation where the two sides will have an in-depth exchange of views on implementing the DOC, strengthening maritime cooperation, and moving forward consultations on the COC. They will discuss how to derive more synergy by aligning development strategies and forge a more closely-knot China-ASEAN strategic partnership. Tomorrow will also see the holding of the 1st meeting of China-Philippines bilateral consultation mechanism on the South China Sea issue. The two sides expect to have friendly exchanges during this meeting on the relevant maritime issue and properly manage disputes through bilateral dialogues so as to create favorable conditions for the final settlement of the relevant dispute and ensure a good atmosphere for the sound and steady development of bilateral ties and the smooth progress of practical cooperation in various fields. Given all these, Japan still exerts itself in every possible way to stir up trouble and exaggerate what it called "the tense situation" which does not exist at all. It is still possessed with the so-called South China Sea arbitration case that has already been turned over as a page of history. We cannot help but wondering: what does Japan really want? Peace and stability in the South China Sea? Or is it exactly peace and stability in the South China Sea as well as improving relations between China and the Philippines and other ASEAN member states that worry Japan so much? We urge Japan to adjust its mindset, say more for mutual trust between regional countries, and do more for regional peace and stability. If Japan truly wishes for improving its relations with China, it should honor its words with specific policies and concrete actions. We also hope that the relevant country outside this region can sharpen its eyes about the regional situation and objectively and rationally view the South China Sea issue. It should not let itself be taken advantage by the other. It should play a constructive role for regional peace and stability, instead of the contrary. Q: The Executive Secretary of the Economic Commission for Latin America and the Caribbean (ECLAC) recently called on countries of the Latin America and Caribbean (LAC) to join the Belt and Road Initiative. She said that the LAC countries are now facing a historic opportunity to strengthen ties with China and other economies in Asia, and the BRF offers an initiative to link cultures and share prosperity. What is your comment? A: Presidents of Chili and Argentine and ministerial officials and senior officials of regional organizations of the LAC participated in the BRF. Executive Secretary of the Economic Commission for Latin America and the Caribbean (ECLAC) Alicia Barcena attended the high-level thematic session on trade connectivity and made remarks on behalf of the LAC. Representatives from the LAC said that they would like to seek greater synergy between the regional and national development strategies and the Belt and Road Initiative, accelerate infrastructure building of the Southern Hemisphere, and promote South-South cooperation. This shows that the Belt and Road Initiative corresponds with the development needs of the LAC countries and echoes with the urgent aspiration of all to enhance connectivity and mutually beneficial cooperation. The LAC, which are made up mainly of developing countries and emerging economies, is an important cooperation partner for China. In recent years, all-around cooperation between China and the LAC has been developing in a comprehensive and rapid way. The two sides are now at a new development stage where a community of shared future will be forged together. The Belt and Road Initiative offers an open and inclusive platform for development. In the process of moving forward the Belt and Road Initiative, every country is equal in participating, contributing and sharing benefits. We look forward to the LAC countries playing an active role in the Belt and Road international cooperation, strengthening coordination of economic policies and complementing development strategies. The concept, principle and cooperation modes of the Belt and Road Initiative could be applied to advance practical cooperation in various fields so that the dividends of this Initiative could reach more countries and regions. Q: It is reported that at the invitation of the chief of staff of Japan's Self Defense Forces (SDF), Admiral Katsutoshi Kawano, Commander Harry Harris of the US Pacific Command visited a radar station which was opened last year on the Ryukyu Islands by the Japanese SDF. The station is near Diaoyu Dao. Some believe that the two visiting together is meant to counterbalance China which has been stepping up maritime activities. Harry Harris also said on May 17 that Diaoyu Dao falls under Article 5 of the Japan-US security treaty, and the US will safeguard Diaoyu Dao like it does with Hokkaido. What is your comment? A: We have noted these statements made by Mr. Harris, and we are strongly concerned about that. I want to stress that Diaoyu Dao has been China's territory since ancient times, a fact that will not be changed by anything said or done by anyone. The determination and resolve of the Chinese people to safeguard its sovereignty and territorial integrity will not waver as well. We hope that what relevant parties and persons do could be conducive to regional peace and stability. Q: About Special Envoy Lee Hae-chan of ROK President Moon Jae-in, you mentioned his meeting with Foreign Minister Wang Yi. Will the Chinese leadership meet with him? Does China expect to dissuade the ROK from deploying the THAAD through this visit? A: China attaches importance to the visit of Special Envoy Lee Hae-chan. This afternoon, Foreign Minister Wang Yi will meet with him. As for meetings with other Chinese leaders, we will release relevant information in a timely manner. We hope that the two sides can use this visit to thorough exchange views on China-ROK relations and issues of mutual interest or respective concern. As for the THAAD issue, China's position on opposing it is very clear.